Corchorus Linn., Sp. P1. 529. 1753. Gen. Pl. ed. 5.234. 1754; D.C., Prodr. 1:504. 1824; Benth. & Hook. f., Gen. Pl. 1:235. 1862; Masters in Hook. f., Fl. Brit. Ind. 1: 396.1874; Ghakravarty, H. L. in Bull. Bot. Soc. Bengal 15:75-86. 1953; Hutch., Gen. Fl. Pl. 2: 482.1967. Herbs or undershrubs, rarely shrubs, with simple and stellate hairs. Leaves petiolate, alternate, serrate, stipulate. Inflorescence an axillary or antiphyllous, 1-5 (-8)- flowered, shortly pedunculate cyme. Flowers small, subsessile or shortly pedicellate, tetra or pentamerous, bracteate. Sepals 5, rarely 4, free, valvate. Petals 5, rarely 4, free, mostly imbricate, neither pitted nor glandular at the base. Stamens 8-20 or many, free, anthers versatile. Carpels 2-5, syncarpous; ovary superior, 2-5-loculed, each locule many ovuled; style simple, stigma simple, papillate, undulate or crenate. Capsule elongate, linear-oblong or sub-globose and muricate, 2-5-loculed, locules aseptate or transversely septate between the seeds, loculicidally dehiscent. Seeds pendulous or horizontal, endospermous, embryo curved with cordate, foliaceous cotyledons. About 100 species; distributed in the tropics and subtropics. Corchorus olitorius var. incisifolius Aschers. & Schweinf. Corchorus acutangulus auct. non Forsk. (1775); Lam. = Corchorus aestuans Linn. Corchorus aestuans* auct. non. Linn. (1758); Forsk. 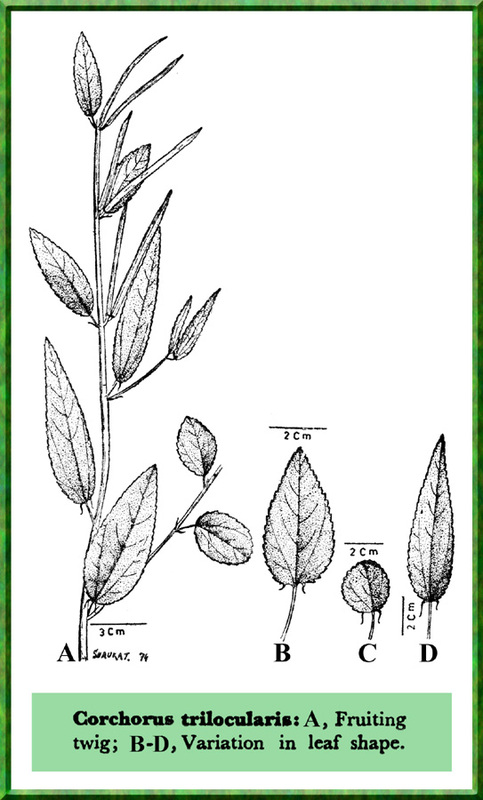 = Corchorus trilocularis* Linn. Corchorus asplenifolius E. Mey. ex Harv. & Sond. = Corchorus trilocularis* Linn. Corchorus brachycarpus Guill. & Perr. = Corchorus fascicularis Lam. Corchorus burmanii DC. = Corchorus tridens Linn. Corchorus catharticus Blanco = Corchorus olitorius Linn. Corchorus cordifolius Salisb. = Corchorus capsularis Linn. Corchorus decemangularis Roxb. = Corchorus olitorius Linn. Corchorus fuscus Roxb. = Corchorus aestuans Linn. Corchorus marua Buch.-Ham. = Corchorus capsularis Linn. Corchorus oppositiflorus Hassk. = Corchorus aestuans Linn. Corchorus quinquelocularis Moench. = Corchorus olitorius Linn. Corchorus senegalensis Juss. ex Steud. = Corchorus tridens Linn. Corchorus serraefolius DC. = Corchorus trilocularis* Linn. Corchorus triflorus Boj. = Corchorus trilocularis* Linn. Corchorus trilocularis auct. non Linn. (1767) : Burm. f. = Corchorus tridens Linn.